Barambah Aboriginal Corporation for Community Health was incorporated on the 22 August 2001 under the Office of the Registrar for Aboriginal Corporations. The Barambah building is named after the late Berlene Faye Chapman (nee Murray) who was active in her vision to see medical services provided to the Cherbourg community. 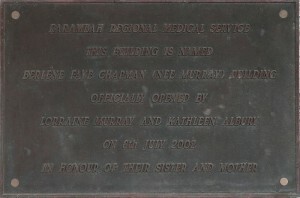 The building was constructed by Indigenous community members and was officially opened during NAIDOC week, on the 8th of July 2002, by Lorraine Murray and Kathleen Albury in honour of their sister and mother, Berlene Faye Chapman.